Judge Naomi Harney, Senior District Judge, 97, of Amarillo died August 16, 2018. Judge Harney will be available for viewing at Schooler Funeral Home on Sunday, August 19th and Monday, August 20th from 8:00 a.m.-8:00 p.m. Graveside services will be held at 10:00 a.m., Tuesday, August 21, 2018 at Memory Gardens Mausoleum Chapel with Don Emerson as officiant and special music by Patrick Swindell. Interment will follow in Memory Gardens Cemetery. Arrangements are by Schooler Funeral Home. 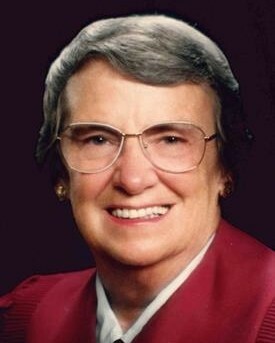 Judge Harney was born July 24, 1921 in Wayland, Kentucky to Guy and Myrtle Allen Childers. She was reared and schooled in the hills of Kentucky. In her senior year, Judge Harney attended and graduated from Ashland Senior High School in Ashland, KY.
During World War II, Judge Harney was employed at Wright Patterson Air Force Base in Dayton, Ohio. Later, she was employed as clerk in charge of the Draft Board in Hutchinson County, Borger. Judge Harney received her B.A. degree from The University of Texas and her Doctor of Jurisprudence from The University of Houston Law School. As a law student, she was employed at Stanoind Oil and Gas and attended classes at night. She graduated in May 1957 as one of 2 women in the graduating class. Judge Harney was quoted "You can get as much education as you wish by being tenacious." In law school, she was a member of The Order of the Barons, Kappa Beta Pi Legal Sorority, and also received the W. St. John Garwood Award for 3 semesters of Excellence in Scholarship from The University of Houston. After graduation, she chose Amarillo to begin her legal profession. Her first position was Assistant City Attorney, the Assistant District Attorney. In 1960, Judge Harney was elected County Attorney for Potter County and served as County Attorney until 1974. In 1975, she was elected Judge of the County Court at Law, Potter County. She was appointed to the newly created 251st District Court for Potter and Randall Counties by Governor Dolph Briscoe and re-elected to 3 terms, retiring January 1, 1989. Judge Harney then became a Senior District Judge and presided as Judge in many District Courts throughout Texas. Judge Harney received the Texas Panhandle Award for Distinguished Service from West Texas State University in 1987 and the Lifetime Achievement Award from Amarillo Women's Network in 1988. She was an active member on several boards, civic organizations, and women's organizations. Judge Harney was also a member of the Judicial Section of the Texas State Bar and Amarillo Area Bar Association. Judge Harney was a devout Methodist since birth and in her spare time, she loved to dance, hunt, and fish. She is preceded in death by her parents; 2 brothers; 2 sisters; and her special friend, Adele Barnes. Judge Harney is survived by her sister, Patty Erwin and husband, Dr. Bill Erwin of Kettering, Ohio; and many nieces and nephews. In lieu of flowers, the family suggest memorials be made to Amarillo S.P.C.A., 11901 Coulter St. Amarillo, Texas 79119.